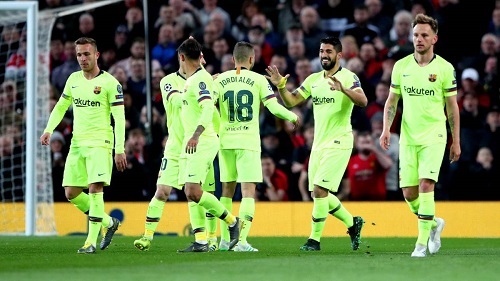 FC Barcelona captured their first ever Champions League victory over Manchester United at Old Trafford with a 1-0 defeat courtesy of a Luke Shaw’s first-half own goal. The Blaugrana scored what would turn out to be the lone goal of the game in the 12th minute when Luis Suárez’s header deflected off of him and into his own net. Messi had gathered Sergio Busquets’s superb ball over the top and the magician pulled off another amazing trick when he somehow crossed the ball to the back post for Suárez, whose header deflected in off Shaw. At first, the goal was initially ruled out for offside but that decision was overturned following a VAR review, and the goal was allowed to stand. Manchester United defender Smalling unintentionally caught Messi in the face, which caused Messi to suffer a nasty nose bleed. However, Messi would play on and end the game with bruising and swelling around his nose and cheek. Barça will host Manchester United next Tuesday at the Camp Nou and will most likely rest their starters for this weekend’s away league encounter to Huesca on Saturday. Manchester United: De Gea, Dalot (Lingard 74′), Young, Smalling, Lindelöf, Shaw; Fred, Mc Tominay, Pogba, Rashford (Pereira 85′), & Lukaku (Martial 68′). Goals: 0-1, Shaw (own- goal, M.12). Cautions: Busquets 18′, Shaw 19′, Vidal 71′, McTominay 86′. Previous PostBarça has one hand on league trophy after 2-0 victory over Atletico Madrid. Next PostBarça are Finally Ruthless.